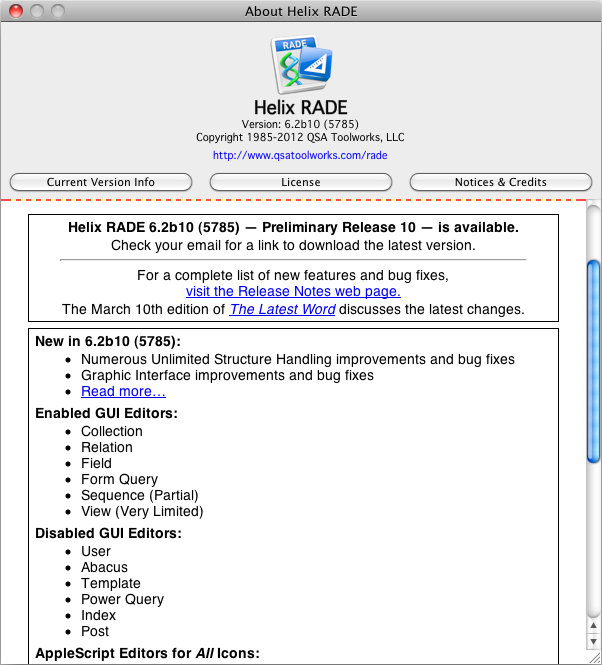 10 March 2012 — The good progress continues with the tenth Preliminary Release of Helix RADE 6.2 for macOS available today. For those out there who haven’t joined us yet, remember that if you’re thinking of joining the monthly plan this month, the initial payment is now $200.00, which you will notice, if you have been paying attention to the subtle changes in this apparently boilerplate text-block from month-to-month, is the same amount as the full-year discounted price. The decision is, of course, yours. If you decide to hop on board right now, you can just pay the $200 and get the two remaining updates free. But if the spirit of love and goodwill fills your heart to the point where you elect to go on the monthly plan because you know how much we need those two more payments, they will cost you $20 each and we promise not to think you’re crazy for doing so! One more note regarding updates: remember that your participation in the Europa Pioneer program entitles you to Interim Builds. What are these things and why should you care? Think of it like this: all month we work and work and work to get something just right by the 10th of the month and into your hands. But we keep working after that and sometimes make dramatic improvements as we go along. You don’t have to wait an entire month to see these things. As always, the complete notes regarding what’s new in this release are found in the Preliminary Release 10 Release Notes. For now, let’s have a look at that long-slumbering, long-suffering completely critical component of Helix that has just begun to stir. In retrospect, the monthly development cycle for RADE these past ten months can be characterized as having had three focal points. The first is the revelation of another new component, warts and all. The second is the improvement (aka: bug fixes) of what was introduced the month before. The third is the completion (aka: spit and polish) of what we put into place the month before that. As anyone who has followed along this far surely knows, we diverged from the path a bit last month, bringing a powerful new capability to Helix. 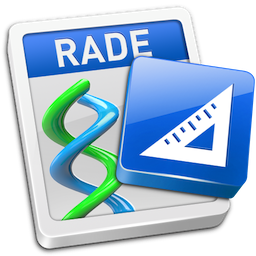 The unlimited application of structure — the ability to update an entire collection at once — is now realized in Helix RADE. This month’s release addresses the reported bugs in that code, as well as adding ‘fit and finish’ to make this feature complete. In fact, it works so well, that we can now reveal to you that this capability will ultimately become part of Engine and Server as well, fulfilling the dream of transparent collection updating in the field. But that’s for another day. In a way, this divergence totally fits the bill as the completion of a part of Helix that has improved gradually since its introduction many years ago. Preliminary Release 10 shows that what was introduced as “copy-and-paste structure,” has matured to the place where that name no longer adequately describes the wonderful things that can be done with it. The addition of Clippings in Helix 6.1 and now the ability to work with whole collections brings us into a much larger realm, and the old terminology doesn’t do justice to the new capabilities. Copy Structure remains a valid term in our vocabulary, as does Save Structure (as Clipping), but ‘Paste Structure’ is wholly inadequate, and so we now call this Apply Structure, which better reflects the fact that the incoming structure may be pasted from the clipboard or read from a file. And so, the dialog that has been the focus of so much interest these last two months is now known as the Apply Structure dialog. 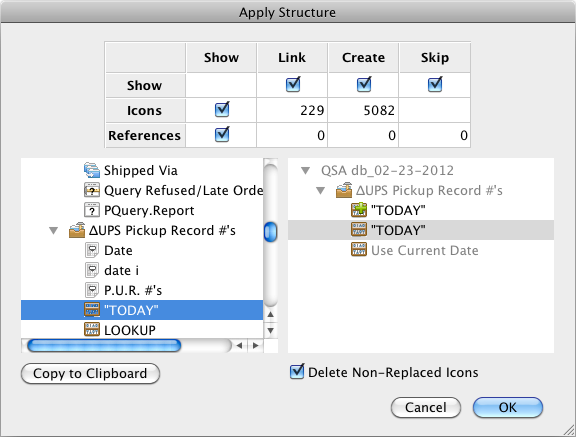 The updated dialog debuts our new internal icons and features many improvements over last month’s release. See this technote for all of the details. But the really big news this month is the re-awakening of Helix’s Graphic User Interface (GUI), and it comes in three relatively small packages that provide sparkling glimpses of the very near future. In Classic Helix, the settings you used to ‘adjust’ an icon were scattered in various places. Some were in the √ menu, others were found in the multitude of dialogs that made up a large part of the Classic interface. Occasionally you would see a group of them labeled as “attributes” — if they had a name at all. In the AppleScript world, which Helix has joined in a big way, these things are referred to as “properties.” We like that term, and have adopted it to refer to all of the settings you can manipulate in Helix. A Helix field icon, for instance, has a property that defines what type of data it will store. It can be seen in the Inspector (and in AppleScript) as the “Data type” property. A sequence icon has a property that tells it whether or not to display a “Why?” message. A post icon has a property that controls whether it posts to just the first matching record it finds, or to every matching record. The list of properties is extensive. A quick look at Helix’s AppleScript dictionary will give you a sense of how many there are. One of the things we wanted to accomplish in the macOS RADE GUI was to bring together all the properties of an object in a single location. This way the Helix learning curve is no longer complicated by having some properties set in a dialog box while others are selected from a menu. In fact, we sometimes talk to Helix users who are not even aware a particular feature — such as the ability to create ‘three-up’ mailing labels — exists, because the only way to set it is buried in a dialog box that you can only get to by double clicking on a repeat rectangle. For the first time ever in macOS native Helix, you can choose the template to use with a Form Query via the GUI. Open the Inspector, create a new form query (via the Icon menu) — or select an existing form query — and choose a template from the ‘query template’ property popup. Click the commit button and your form query is instantly changed. Sequences can also be partially edited in the Inspector. 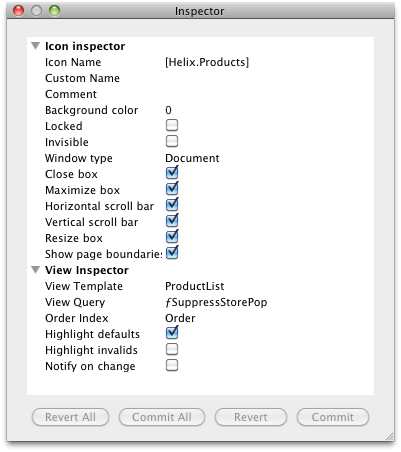 With the Inspector open, click on a sequence: you will see all of the properties that were available in the right hand side of the Classic dialog. At this point, the main part of the sequence editor — the ability to specify the steps of the sequence — is not available, but you can see the promise of the Inspector. Likewise, Views can be partially edited in the Inspector. In this case, we just barely scratched the surface (it was the last thing we did before the deadline) but you can already choose a template, query, and index. (But be aware that choosing a template that has a subform will trigger a crash, because the code to set up the subform is not ready yet.) And for those who have complained about the change from a dot overlay to shading for the ‘Shade Invalid Fields’ and ‘Shade Default Values’ properties, you can turn them off (or on) in the Inspector. Again, this really only scratches the surface of what the Inspector will bring us. But the promise is clear to see, and we hope you are as excited by this development as we are. The progress we made this month in putting these new GUI tools in place was very smooth and steady, building upon several weeks of infrastructure work to prepare for it. When we saw how smoothly it went, we made a decision to press forward with as much GUI work as we can do quickly, and so we anticipate that April will bring at least some part of every icon editor out into the open. That means we are delaying the Helix Utility rewrite yet again. We know it is becoming an important need, but we estimate that it is going to take the better part of a month to do, and with just two months left in the first year of the Europa Pioneer Plan, we want to deliver as much of RADE as we possibly can. So don’t look for the new Helix Utility until June or July. And as noted last month, we also plan to begin testing Client/Server and Helix Engine 6.2 soon. We are building them right along with our RADE advances, but we have been so preoccupied with RADE that we have not devoted sufficient mind-share to when we want to start testing them. Stay tuned on these items. As always, we continue to need your active support. The Europa Pioneer program comes to a conclusion on May 31st, and we have spent considerable time this month devising our plan for the next steps. We still haven’t formulated all the details, but, as last month, one thing remains certain: anyone who was a Europa Pioneer, whether they joined on the first day or the last, will be in the best upgrade position for the next phase.